A favorite among many CCW holders and law enforcement agencies, Speer Gold Dots use a molecularly bonded jacket and core that stay together with unerring reliability as they enter an assailant, then expand rapidly to put him or her out of action. 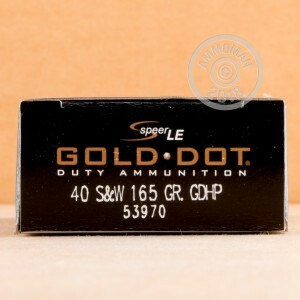 This .40 S&W load features a Gold Dot bullet specifically designed for the cartridge. The light 165 grain bullet produces high muzzle velocity and good penetration through thick clothing or light cover. 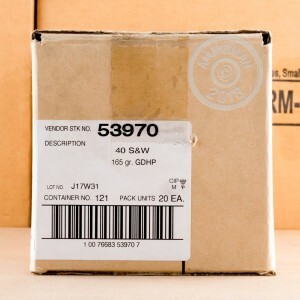 This 1,000 round case is a great choice for the discerning operator and comes in convenient 50-round boxes at a moderate price. 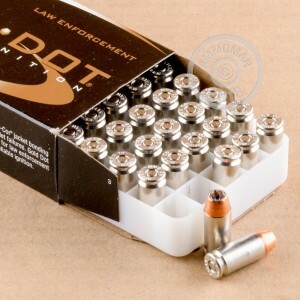 These rounds use reloadable nickel-plated brass cases and CCI's non-corrosive Boxer primers. Buy in bulk and save! All orders over $99 ship for free from AmmoMan.com. We created this policy to help our high volume customers save even more on big orders and keep them coming back for more great deals on ammo!